So, the answer to the question do penguins have legs is that Yes, they do have legs! It’s just that the legs are folded up under their bulk and they do not have the need to use their legs unless they are swimming in the sea. When you look at smaller penguins such as fairy penguins or Galapagos penguins, you can clearly see that they have legs. When running from danger or coming out of the ocean, the birds often spread their flippers and move quickly which makes their legs clearly visible. For larger penguins, it is difficult to see their legs as they fold their legs at the knee and keep them close to their body. 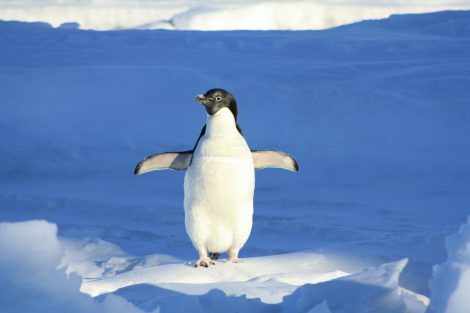 This makes it difficult for the bigger penguins to walk and their walk is more like a waddle from side to side. Smaller penguins like Rockhopper penguins can skip and hop over obstacles easily. Penguins also use their legs to push off the ice by lying down on their stomach. This allows them to slide on the ice and cover short distances easily. A penguin leg has four parts – femur, knee, tibia, and fibula. Penguins keep their legs tucked in close to their body and these are also covered in small feathers. This gives penguins the appearance of being bow-legged or having short legs. The position of their legs also gives them a streamlined shape when they are swimming underwater. Their body’s torpedo-like structure helps them to dive deeper and move swiftly through the water and they keep their legs close to their body for efficient movement underwater. .
Their body covers most of their legs, and they only extend their legs while they are swimming to push through the water. By using both their flippers and their legs, penguins are able to swim fast and reach their prey quickly. They also use the power of their legs when they have to exit the water. They make an explosive exit which allows them to escape any predators that might be waiting for them near the water’s edge. Another advantage of having legs is that penguins in cold regions can adjust the blood flow in their legs so that their feet do not freeze while they are standing on the ice for long periods of time. While the rest of their body is insulated against the cold, their feet are vulnerable, and the temperature control helps them to keep their feet safe from the cold. To sum up, yes, penguins have legs and they use their legs efficiently for different purposes. 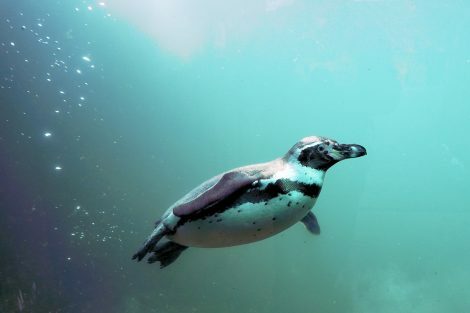 Whether it is moving on the land or swimming in the water, penguins will not be able to do either without the use of their legs. Bigger penguins like King penguins and Emperor Penguins also incubate their eggs by balancing the egg on their feet and warming it with a pouch between their legs. So, what do you think about penguin legs? Do you think they serve a strong evolutionary advantage over other birds? Do you think penguins can use bigger and stronger legs? Do let us know your thoughts in the comment section. If you have any questions about penguins, feel free to ask, and our team will do its best to answer your questions. Where Do Galapagos Penguins Live? What do Macaroni Penguins Eat? What do African Penguins Eat? What Do King Penguins Eat? Do Penguins Have Fur or Feathers? I got interested in penguins from a young age and as I grew I realized that penguins are such fascinating birds. I made it a mission to create a website where all information about penguins could be accessed in an easy to read format.